Never mind his team’s early three-goal lead in the Section 6 title game. 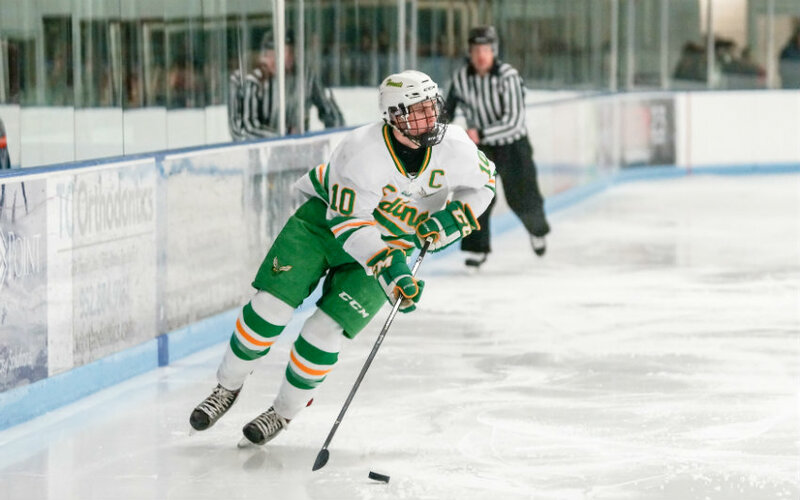 Edina senior forward Sammy Walker refused to yield an inch of ice. Using his incredible speed, Walker caught the Wayzata skater from behind, swatted away the puck and kept the Trojans on a carousel of fruitless offensive efforts. The play didn’t produce one of Walker’s 32 goals or 36 assists this season, but it showed his hunger to get back to the state tournament, a grand destination he last visited as a freshman. Walker is the catalyst of a loaded Edina team hitting the Xcel Energy Center ice at 11 a.m. Thursday in the first Class 2A quarterfinal. A “freaky, spooky good” player, according to one Lake Conference coach, and the Star Tribune Metro Player of the Year. It mattered in the Walker household, too. Older brothers Ben and Jack molded young Sammy’s competitiveness during street hockey battles, where the winner hoisted a homemade Stanley Cup — a cardboard box with a plastic kitchen bowl taped on top. “Usually if I won I was getting a beating from my brothers,” said Sammy, who pretended to be Chicago Blackhawk star Patrick Kane as he scooted around neighborhood driveways and cul-de-sacs. Both of Walker’s brothers left Edina’s program early for Victoria of the Western Hockey League, thereby forgoing their NCAA college eligibility. Sammy chose a different path, verbally committing to the Gophers as a sophomore. Tough brotherly love helped Walker overcome a smaller stature; he was just 5-9, 135 pounds when he made his college commitment as a sophomore. He grew to 5-11, 165 pounds this season and played bigger, too. A threat to score on every shift, Walker centers Edina’s powerful top line of Jett Jungels and Mason Nevers, a trio of speed merchants whose chemistry produced 81 goals and 103 assists, despite just becoming linemates in tryouts this season. Walker takes an equal amount of pride in coming back to help on defense. Early in the season, as the Hornets were closing out a 6-2 victory against Maple Grove, Walker’s hustling made an impression on Crimson assistant coach Gordie Roberts. Click to view the players named to this year's all-metro teams.